I'm enjoying one last day of weekend, which means lovely breakfasts, no makeup and sharing the kitchen table with John as we work on projects. But that's no reason not to share what we've been up to these last few days! It was a crazy-wonderful-stressful week, and by the time Friday afternoon rolled around, I couldn't remember the last time I'd been more ready for a stiff drink and a spicy curry. We met our dear friend at Masala with a bottle of French apple cider and dug into all our favorites dishes while we caught up on major developments in each others' lives. I was struck by how very lucky we've been these last few years to grow strong, wonderful friendships, and couldn't help but reflect on how much love is in our lives. Inspired by the Julia Child quote, "I think careful cooking is love," our Saturday was all about creating a special meal for one another. I'd tracked down a pheasant and John's favorite Champagne dark chocolate truffles at the Ferry Building earlier in the week, and after finding ourselves first in line for Americanos and empanadas at Hollow, we headed to Andronico's to pick up the rest of the ingredients for our sumptuous supper. Our early morning start meant a whole day ahead of us, so after putting away our goods and doing a little prep, we both sat down to work–John at the guitar, me at my laptop and with a stack of envelopes to address! Our light-filled living room was the perfect place to spend the day, and after a dress fitting (squee!) John and I got into the kitchen to try our hands at a new recipe. We did need to open the Champagne before dinner was finished cooking, and I wouldn't recommend the recipe to novice chefs, but the results were heavenly. After dinner, we took the bottle of bubbly, the box of chocolate truffles and a cozy fur blanket up to the roof for an evening of stargazing. We were up early as usual on Sunday and John delivered breakfast to me in bed–poached eggs over avocado toast and a big Chemex full of coffee (plus a cup of English breakfast tea for me). We put the house away quickly and got a few to-do's checked off the list before dashing out to check out an alternative ceremony location; we found out on Thursday that we won't be able to hold our ceremony where we'd originally planned, so we've gotten creative! After our sunny morning site visit, we headed home and got back to work at his & hers laptops. I gave Mary Helen Bowers' latest torture a try that afternoon while John played a bit of Neapolitan jazz in the kitchen, and after a quick trip to the grocery store, we whipped up a simple pesto pasta and headed back up to the roof to dine as the sun set! Then we cozied up with Midnight in Paris, the perfect romantic film for a romantic weekend. Tell me, what were you up to this weekend? Did you celebrate Valentine's Day with a fancy dinner, or pizza and your favorite DVDs? I want to hear all about it! 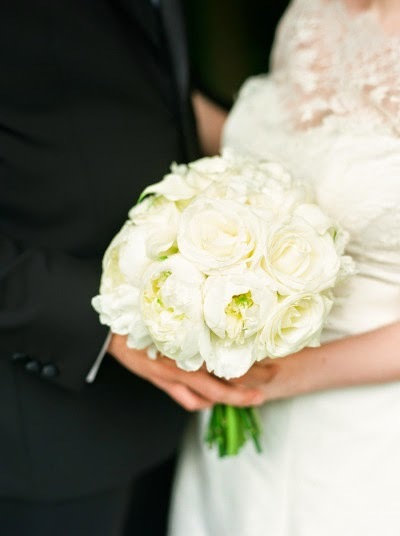 Image by Lindsay Madden, white peony and rose bouquet by Blade Floral And Event Design. Such a classic bouquet. I'm happy to see the simple round shape making a comeback. Me too–it's one of my favorite looks! Sounds like a wonderful weekend! Hope you're enjoying the bonus Monday!